-HEAT large skillet sprayed with cooking spray on medium heat. Add chicken, peppers and chili powder; cook and stir 8 min. or until chicken is done. Stir in 1/4 cup salsa and Neufchatel; cook and stir 3 to 5 min. or until Neufchatel is melted and mixture is well blended. Stir in 1/4 cup shredded cheese. -SPOON heaping 1/3 cup mixture down center of each tortilla; roll up. Place, seam-sides down, in 13x9-inch baking dish sprayed with cooking spray; top with remaining salsa and shredded cheese. Cover. Here's a better-for-you alternative that will save you 110 calories and 11 grams of fat, including 8 grams of saturated, fat per serving when compared with the traditional recipe. 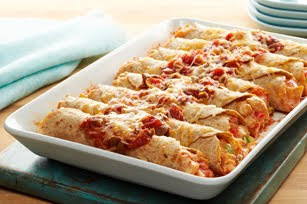 We did it by preparing it with PHILADELPHIA Neufchatel Cheese and KRAFT Mexican Style 2% Milk Finely Shredded Four Cheese and decreased the amounts used for both. Prepare using corn tortillas. To prevent cracking, warm tortillas as directed on package before filling and baking as directed. That looks SO good. We are going to have to make that for dinner. Sounds perfect and exactly like what we enjoy. Appreciate your sharing and looking forward to following you for more! I could eat enchiladas every day of the week. Thanks for the recipe. Very educating blog, bookmarked the site in interest to see much more!